Despite the city centre crawl in the wake of the late afternoon storm, The Guardians of The Glenlivet from the Malaysian Chapter and members of the media turned up punctually at 6.30pm at Saro Lounge on the 8th floor of Pavilion Elite in Kuala Lumpur to find…. closed doors. 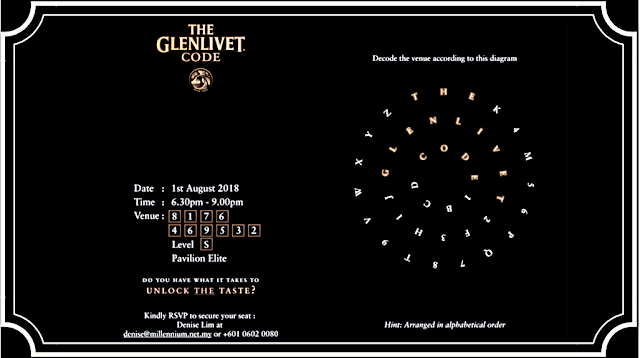 The invitation for the closed tasting of The Glenlivet Code to mark its launch in Malaysia on August 1, required the decoding of a word puzzle diagram to find out the name of the venue. So we thought that perhaps the closed door was a part of The Glenlivet Code mystery evening. Anyway, we all waited patiently and then queued up to register before entering the small but cosy lounge. The Guardians of The Glenlivet receive invitations to private tastings, exclusive events, competitions and limited-release products, as well as Guardian-only access to the Library at The Glenlivet distillery. At present there are 377 Guardians in the Malaysian Chapter. At the door, we were offered a glass of pale gold Founder’s Reserve, a single malt Scotch whisky. Complex and creamy with a smooth finish, this has a fabulous aroma of citrus. On the palate, there are light fruity flavours of orange, pear and apple with hints of chocolate. Then we were served The Glenlivet Code, with a selection of canapes. The Code comes in a solid midnight bottle instead of the usual clear/coloured glass and there is the distinct lack of cask information and tasting notes. Instead, The Glenlivet Brand Ambassador Malaysia Lionel Lau gave a brief history of the mysterious The Glenlivet Code and then guided the Guardians through a series of “taste and aroma” tests. 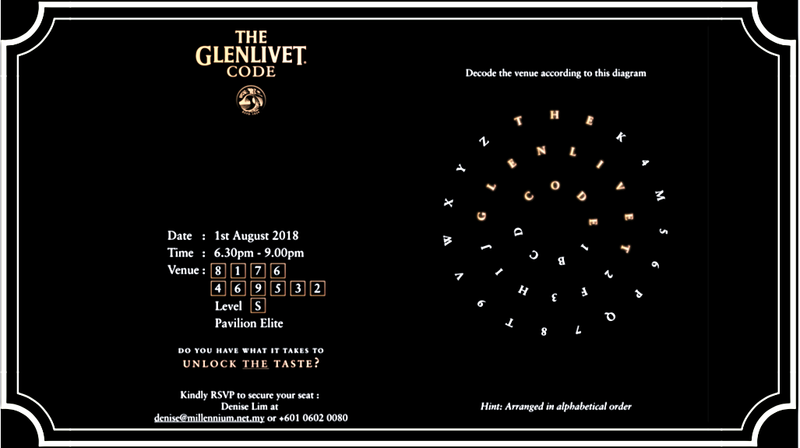 For a taste of The Glenlivet Code digital augmented reality experience, whisky connoisseurs have to scan a code on the back of the bottle carton using the Shazam app to enter a virtual underground room. There, they will be greeted by a hologram of The Glenlivet Master Distiller Alan Winchester, who will challenge them to decode the taste of the liquid by selecting four aromas for the nose and four flavours for the palate from thousands of possible combinations. After “unlocking” the taste, participants will be given a score which they can post on social media to see how they rank against their peers. The official tasting notes won’t be revealed until the end of the year to give connoisseurs time to discover and enjoy the drink. I take a sniff to find aromas of spice and hints of smokiness. On the palate, it tastes of summer fruit with a faint feel of cinnamon and ends with a medium dry finish. But that’s just me. I’m sure it’s different for everyone else. The Glenlivet Code was crafted using new casks and techniques to push the boundaries of what people expected from The Glenlivet.